Beaufort, a rural town on the Western Highway, is 45 km north-west of Ballarat. The Beaufort district was taken up for prosperous pastoral runs, and the Langhi Kal Kal run (1838) contained the future site of the Beaufort township. In 1854 gold was discovered at Yam Holes Creek, immediately north of Beaufort. Within a year the area was being extensively mined, and it was known as the Fiery Creek diggings. (Fiery Creek flows westwards of Beaufort, and was so-named during a drought when the heat apparently generated haze over the creek bed). A hastily built township followed, and surveyed township blocks were sold in March 1858. The high population figures numbering thousands had passed by then, as a census for Fiery Creek in 1857 recorded 1002 male miners. Beaufort was named after Sir Francis Beaufort (1774-1857), a British Rear Admiral and hydrographer. A road district was created in 1861 and on 18 December 1863, the Ripon shire was proclaimed, with Beaufort as its administrative centre. Anglican and Catholic schools were opened in 1863, and the Protestant Hall was built and used for church services (except the Catholic and Primitive Methodist congregations). The hall later became a mechanics’ institute, by when most congregations had their own buildings. A court house and a government school were opened in 1864. 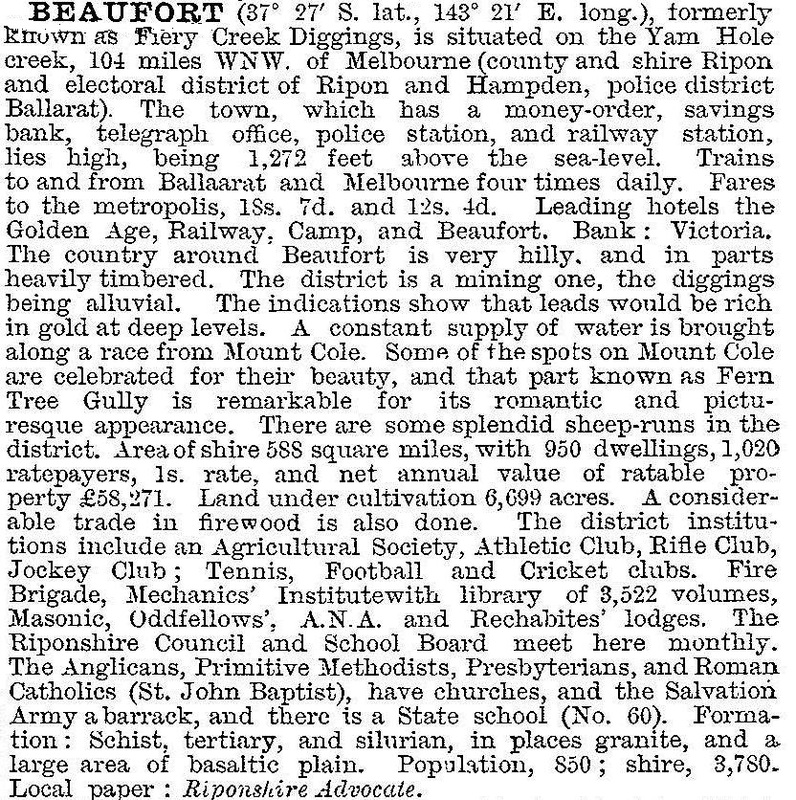 Bailliere’s Victorian gazetteer (1865) recorded Beaufort as having numerous alluvial mining operations in gullies in the ranges near Beaufort, as well as two sawmills, two breweries and several hotels. The gazetteer noted the scenic attractions and numerous watercourses in the Mount Cole area, west of Beaufort. In 1866 the Nationalist poet, Bernard O’Dowd, was born in Beaufort. He later conducted a private school there, until his secularism caused a loss of patronage. By the beginning of the 1900s Beaufort’s population exceeded 1000 people, and at no time since then has it fallen below that figure. In 1925 the primary school began higher elementary classes. After World War I the first dent in the large pastoral estates was made when much of the Trawalla property was subdivided for soldier settlement. There were more soldier settlement farms after World War II. When the town’s population numbered over 1200 the over stretched higher elementary school was replaced with a high school (1960). Beaufort has Anglican, Catholic and Uniting churches, State primary and secondary schools (149 and 170 pupils, 2014), a hospital, a golf course, a bowls club, a recreation reserve, a swimming pool and a public hall. There are three hotels, a motel and a caravan park. Beaufort is the administrative centre of Pyrenees shire (1995) and the Pyrenees Advocate newspaper is published there. The town’s notable structure is a cast iron band rotunda (1903). It is often photographed by travellers and is on the Register of the National Estate. In September 2010 and again in January 2011 many parts of regional Victoria experienced widespread severe flooding. In Beaufort, Lake Beaufort broke its banks and spilled over the dam wall flooding the town’s main street and inundating properties with water to a depth of over one metre. An emergency relief centre was established at Beaufort’s Goldfields Recreation Reserve near the caravan park. Near Beaufort, floodwaters inundated the 38 hectare Lake Goldsmith Steam Preservation Society damaging vintage steam engines, flushing oil and vintage clothing. In January 2013 the Pyrenees Shire Council completed the Beaufort flood mitigation works designed to mitigate the impact and severity of future flooding events. The Council estimated that since 1884 there had been 18 flood events in Beaufort, five of which had been in the period 2001-11. The 2010-11 floods had inundated residential and industrial properties with detrimental effects on an economic, social and community basis when 49 residences in the town experienced flooding above floor level. The Beaufort district hosts the annual Rainbow Serpent Festival, a four day international music and lifestyle festival.